HE IS the chippy who is a chip off the block and is being congratulated for it. Ryan McMillan has been award Gladstone Area Group Apprentices Limited Col Brown Memorial Award winner for 2016. It is the most prestigious award a Gladstone apprentice can win. But for 21-year-old Ryan it was result of almost four years of hard work. "I have been through the group for a while and worked with lots of different employers," he said. "I love carpentry. The best bit is the fitouts." He said he decided to be a carpenter to follow in his dad's footsteps. 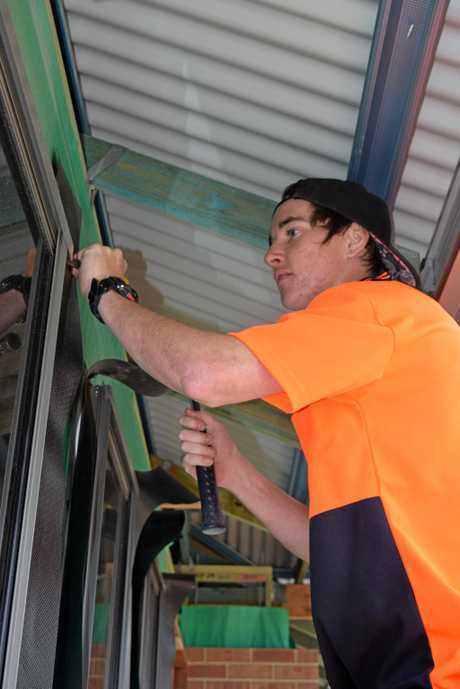 His current host, Ian Marxsen, said Ryan was one of his best apprentices in his 23 years as a builder. MASter vs Apprentice: GAGAL Tradie of the year against builder of 24 years Ian Marxsen. "He is loyal, always on time and even comes to work when he is crook," Ian said with his loud laugh. "Ryan just has a will to learn." Ian said the one thing he always had to drum into Ryan was the cladding. "The nails have to be straight and the boards dead level," he said. Ryan said he did the cladding correctly every time but it was Ian's obsession. GAGAL chief executive officer Leigh Zimmerlie said Ryan was a deserving winner of the Col Brown award, named after the former Gladstone mayor who started GAGAL in 1984. "All of our apprentices are put in for that one and the winner has to be exemplary in all aspects of his apprenticeship," she said. "Ryan has gone above and beyond and can now put the award on his resume." That resume could soon be floating around builders with "tradesman" on it instead of "apprentice" as Ian is keen to fast track Ryan. Ryan is due to finish his apprenticeship in February but Ian believes he will be ready before Christmas.